A discussion of context and medium in Andrew Kozlowski’s show, After Party, exhibited at 1708 Gallery in Spring 2014. 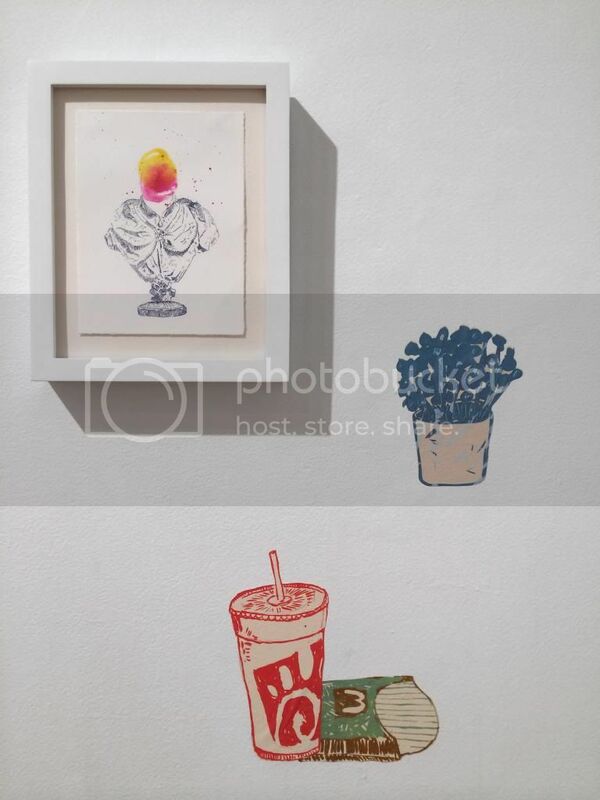 After Party, a solo exhibition by artist Andrew Kozlowski, is a festive play on the gallery walls: a menagerie of still-life objects—set free from their places—disobey the script, classical busts commingle with fries, coolers with cinder blocks, and pink plywood with potted cacti. The initial impact is one of visual pleasure and the installation carries this high note throughout the gallery. Although the work—all on paper—hugs the walls of the space, the scale and installation in some cases prompt active viewing and in others can be taken in from a distance (fig. 1). 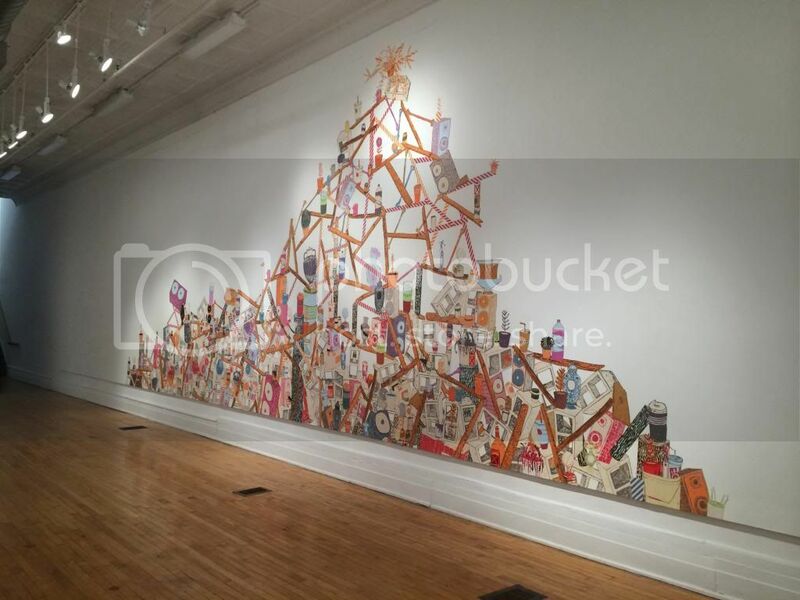 Most of the works are silkscreens on paper depicting objects at life size, and woven into this are drawings with pen, watercolor paintings, gum transfers, and even some confetti. 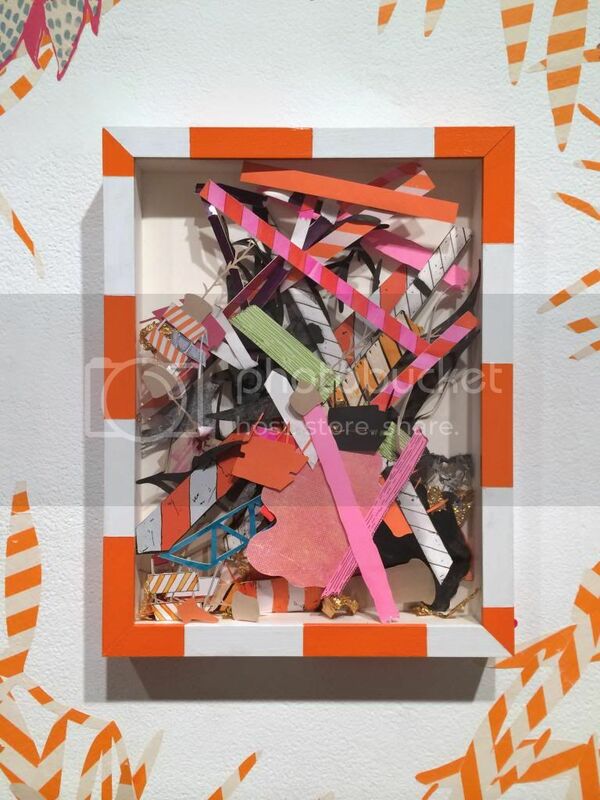 Orange and white stripes, like those on hazard blockades or police ribbon, underscore everything in the gallery. In the bright sheen of the tints present everywhere else, however, the sense of danger or caution falls by the wayside. The main gallery space is a wheat-pasted constellation of prints from floor to ceiling in an at once orderly and then haphazard pattern (fig. 2). Kozlowski has several themes running in tandem: the college party—handle of booze, solo cups, domestic beer cans, two-liters; the fast-food meal—to-go cup, unwrapped burger, coolers, fries; the museum collection—classical busts and vases; and what’s left in the kitchen sink—potted plants, traffic cones, trophies, cinder blocks, buckets with paintbrushes. Connections between the objects form and then dissolve. Is it art, or a glimpse into an open garage? Is this a still-life with significance that forms in the space between, or simply a visual pairing? The installation takes a provocative stance here, when the eye and mind waver from their habitual efforts to reason connections between the printed images. In the gallery space all subjects are on equal footing, but as objects in the world, they fall into polarizing conceptual categories of status such as art versus kitsch, or private versus public property (fig. 3). In Kozlowski’s groupings, we begin to equate trophies with potted plants, two-liters with parking cones, etc. The process is one of ascribing an overall even value to objects that we might otherwise place in hierarchies. This leveling of the playing field makes the leap across the gallery onto the opposite wall where another wheat-pasted installation fills the vertical face (fig. 4). In the space between these two walls, order has succumbed to gravity and a teetering house of cards balances atop pieces and parts that have fallen into a heap at the base of the wall. The sense of democracy, of all objects as equal, transforms into a sense of all objects-as-needed to support the rising mountain of stuff (fig. 5). Kozlowski’s exhibition creates an oscillating relationship between order and chaos, treasure and trash, and the extremes of frivolity and caution. This is present in the imagery, but also in his approach to material and the medium of printmaking. 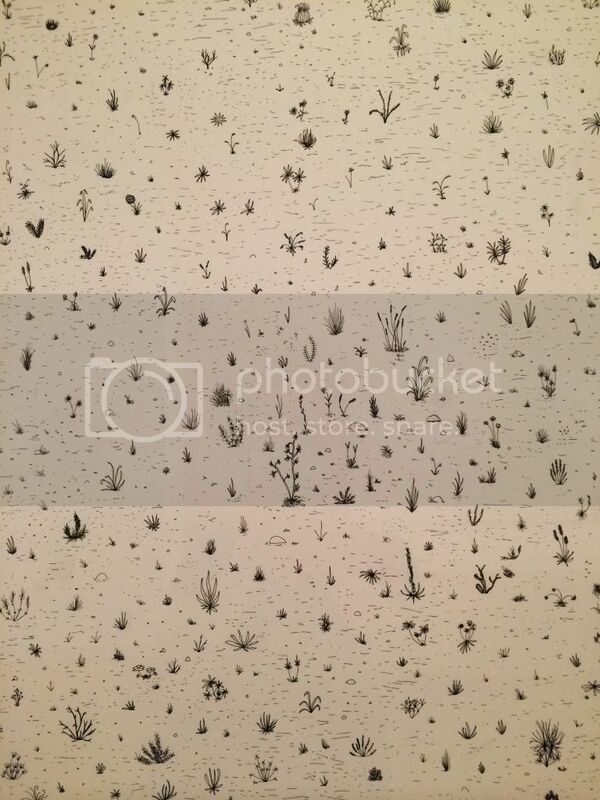 There is tension between the tidily framed works on paper, primed for sale, and the massive installations of prints applied directly to the wall and, in that action, primed for destruction at the show’s culmination. The concurrent actions of displaying what we may prize most highly as a society—the trophies, classical busts, and even the very art in the room—and what we discard most readily in fast food containers, or deconstructing old homes to throw together the new, galvinizes as an embrace of the demise we find ourselves in as a species. Our consumptive habits have backed us into a corner. Landing on this conclusion amid the reverie of the installation feels both deflating and satisfying, not unlike the morning after a disastrously great party. From the small frames to the installations that engulf them, the exhibition is an exploration of works on paper and, more specifically, of prints as a tool for visual communication. Kozlowski offers the unique and prized opportunity to experience how the historical trappings of printmaking maintain a foothold in contemporary context. 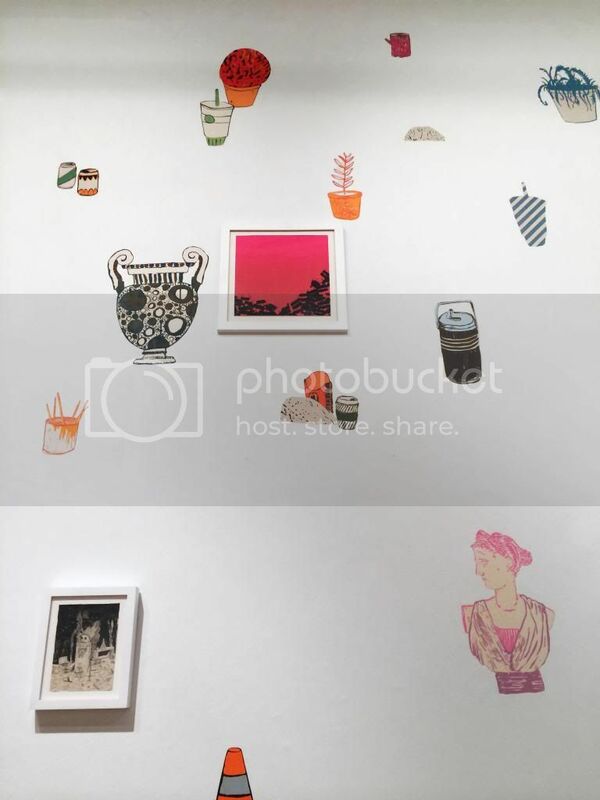 There are many multiples in the exhibition—repeated objects and images made through print processes. Furthermore, Kozlowski repeats visual cues such as stripes, composition, and color combinations, throughout the space (fig. 6). When stripes move from potted plant to hazard sign to decorative background, the chorus of that visual information begins to pull together disparate objects, equalizing their status as consumables and personified actors in his open-ended eco-tragedy narrative. This show is also an energetic display of prints, which are often housed in closed collections, stored in files, or at the very least behind glass. The making process is similarly obscured from public view in printshops and classrooms. However, Kozlowski subverts the timidity of the print by bringing his process out of the shop and into/onto the gallery itself. All of the wall installations in the exhibition were constructed on site. The precariously balanced exchanges of culture and consumption are the dominant topics, but the themes maintain an objective and ruminating stance rather than an accusatory one. Does this let an American audience off the hook? No, the conversation diverts into issues of how our refuse might be revisioned as something else. We gain a taste for well-applied design elements like color and pattern, which may translate to a more conscious level of consumption. Finally, the work reiterates its democratic leanings (also a hallmark characteristic of printmaking) in the accessible price point and exposure in a not-for-profit art space. These two qualities cannot be understated as influencers in the exhibitions content itself. Through green cinder blocks, tangerine plywood, and silver caution stripes, Kozlowski’s exhibition expands a discussion of disposable culture and, of high importance to global society, offers a space to take stock of where we may find ourselves in the after party of advanced capitalism. In the social order that emerges from his rubbish arrangements and taste for design and color, we are reminded that production, marketing, and consumption are agents of action, even as they sit as static, untouched multiples on store shelves. Without reaching any conclusions, this exhibition is a visually rich example of how creative problem solvers, such as artists and designers may have a new, if not fantastical, approach to how we as a society move forward with caution. Paloma Barhaugh-Bordas is an artist based in Richmond, Virginia. She is a faculty member at Virginia Commonwealth University in the Painting and Printmaking department. Her artistic work addresses American cultural identity and builds on the history of printmaking as a democratic and evolving medium. 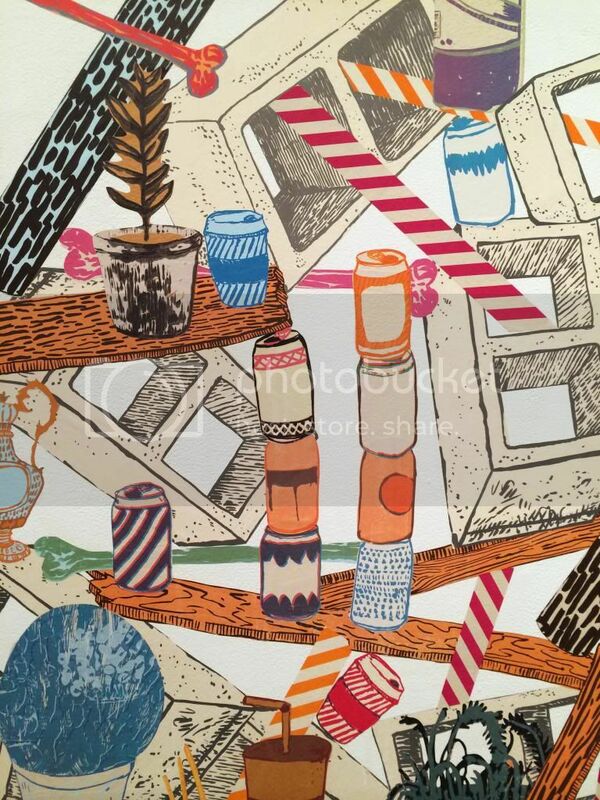 She received an MFA in Printmaking from Rhode Island School of Design and BA in Liberal Arts from Carleton College.